Cooks Bay Villas aims to reflect a feeling of being a ‘home away from home’, on an island in the beautiful South Pacific. The property is settled along one of the most beautiful white sandy beaches of Rarotonga – Cooks Bay, Vaimannga. Click here to book your Cooks Bay Villas accommodation now. Our beautiful Rarotonga Villas are right on the beachfront and have their own private aspect looking out across the lagoon to distant waves breaking on the coral reef. Words can’t explain how beautiful this place is and the serenity it exudes. Our luxury Rarotonga accommodation is perfectly nestled among the many mature coconut trees and native plantings that surround the property. You’re only seconds from the soft white sand and aqua waters of the lagoon – you can snorkel and swim right from your doorstep! Each Cooks Bay Villa has two separate bedrooms and their own ensuite bathroom complete with a large shower. Your spacious living area opens onto your expansive private balcony for your relaxation and pleasure. 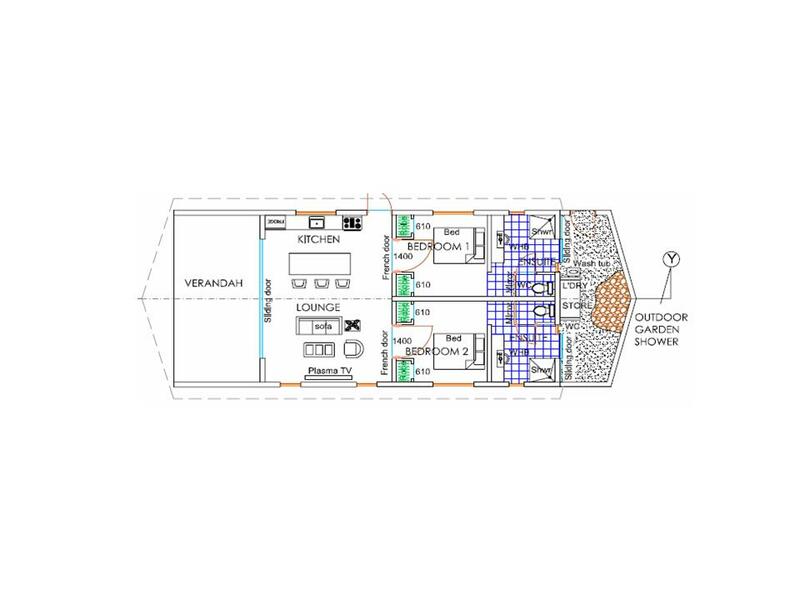 Click here to view a floor plan of your luxury Cooks Bay Villa. Please advise the office (preferably within 24 hours of requirement) if any airport transfers are required - if they have not been pre-arranged. This will allow us time to give our transfer operators to organise themselves and the services required. We welcome you to stay for any length of time at our Rarotonga villa accommodation – if you would like to know more about a long-term stay at Cooks Bay Villas – please contact us. Click here to book your luxury Rarotonga accommodation at Cooks Bay Villas.